Gary Thomas Fisher Jr. knew that every shot was a gamble. The day after his 14th overdose, Gary Thomas Fisher Jr. figured his romance with heroin, and her nightmare sister fentanyl, had to end soon, one way or another. Nearly four months later, on an unseasonably warm Thursday afternoon, the former ironworker and father of two — chronicled weeks ago in the special report Riding OD Road — was found dead in a house a block from his childhood home. He was 29. The cause of Mr. Fisher’s death isn’t finalized, but family members have no doubt that it was a drug overdose. He was found on the floor of a longtime friend’s bathroom. To date, the Allegheny County Office of the Medical Examiner has finished work on 499 overdose victims this year. Of those, 70 percent are male. A plurality of 28.5 percent are between the ages of 25 and 34. Starting on the day of Mr. Fisher’s Aug. 3 overdose, the Pittsburgh Post-Gazette reached out to him, and he immediately saw the value of sharing his story, in the hope that it would help some other struggling person or family. Over the course of six weeks in August and September, he spoke repeatedly and at length about better days, and the damage he was doing to his body and his loved ones. He called himself “a crystal meth baby. … While my biological mom was pregnant with me, she was using crystal meth and drinking tequila.” He said she “popped in and out of my life at random” before committing suicide a few years ago, but was quick to add that his plight wasn’t anyone else’s fault — it was his. He attended City Charter High School and did well, according to family, but then dropped out months before he would have graduated. He made good money as an ironworker, in construction, driving trucks or fixing cars, accumulating vehicles and a boat. He yearned to learn to work on classic Harley-Davidsons with the “shovelhead” engines that were phased out before he was born, and dreamed of owning a 1971 Chevrolet Chevelle. He had a son, followed later by a daughter. Fatherhood, though, didn’t curb a wild side. He said he inadvertently tried heroin, thinking it was cocaine. It grabbed him in a way nothing else did. As his drug use mounted in 2016, Jessica Webber, the mother of his daughter, moved to cut off his partial custody, at various points telling the court that he’d “overdosed approximately 7 times in the 3 years” prior and then later that he’d “overdosed on heroin 4 times in the past month.” His custody was temporarily suspended a year ago. “His addiction took over. But he never stopped loving his daughter,” said Ms. Webber, of McKeesport, on Friday. He stayed off of narcotics during a July vacation in Myrtle Beach, but then overdosed twice in the first week back in Allentown. After the second overdose, he was saved by Pittsburgh Police Commander Karen Dixon and Zone 3 officers with the opioid reversal drug Narcan. Gary Fisher can be seen here recovering minutes after a fentanyl overdose on Arlington Avenue earlier this year. He was saved by a police commander who did chest compressions and officers who gave him four doses of Narcan. Mr. Fisher started trying to get the right health insurance clearances to obtain a prescription for Vivitrol, a shot that can quell the craving for narcotics for a month. Ms. Webber said he never managed to get the insurance authorization, and eventually gave up. “Get clean, get clean, and then it’s a [expletive] nightmare to get help,” Mr. Fisher said, six days after the early August overdose. Instead he moved in with his paternal grandmother in Marshall Township. He started to rebuild his relationship with his daughter. By mid-September, he was thinking long-term. “In the future, I will own my own [mechanic’s] business. I don’t [just] want to. I will,” he said. As a start, he got a job at an oil change place. His recklessness didn’t abate, though. In October he was cited for driving 92 miles an hour with a suspended license. He later wrecked his truck. Family members said he was thrilled when, following the publication of Riding OD Road, a woman contacted him through Facebook to tell him that the story helped her find peace with her sister’s overdose death. He seemed to be in good spirits over Thanksgiving. On Sunday, he showed up in Allentown, then quickly darted off, saying he was going to help someone with a car repair. His family never saw or heard from him again. Deion Lee, a lifelong friend who lives on Excelsior, said that Mr. Fisher knocked on his door Thursday afternoon, asking to use the bathroom. Mr. Lee let him in, but then promptly left to go to work. Later, a member of Mr. Lee’s household noticed that the bathroom door was locked. They broke down the door, found Mr. Fisher dead on the floor, and called the police. 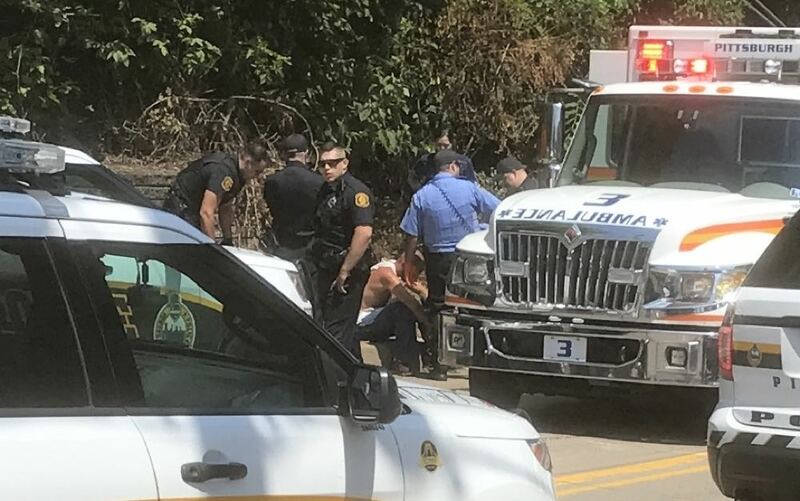 The medical examiner pronounced him dead at 4:44 p.m. Pittsburgh police are investigating. Ms. Webber said their daughter, now 6, “asked me last night why the angels took her daddy. I said they wanted him to be able to look after her from above. Visitation will be Sunday, from 2 to 4 p.m. at the James J. Barry Jr. Funeral Home, followed by a service at 6 p.m. The family, which has limited resources, is seeking help through GoFundMe.